This morning it is in the 60’s here in the DFW area. We need rain and cooler weather. While we did not have as many 100+ days consecutively this summer as we did last summer, we had many that teetered right below 100 degrees. We are so ready for Fall and for things to cool off. 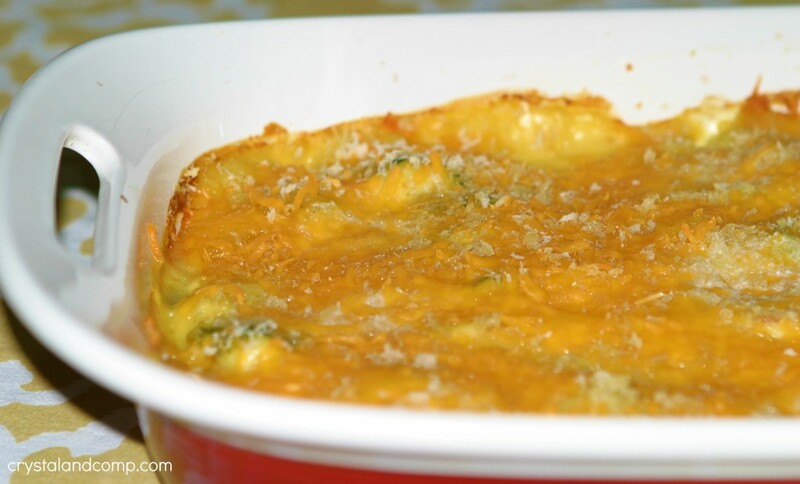 Casseroles remind me of Fall weather and I have a delicious one to share with you today. Remember that family cookbook I told you about recently? 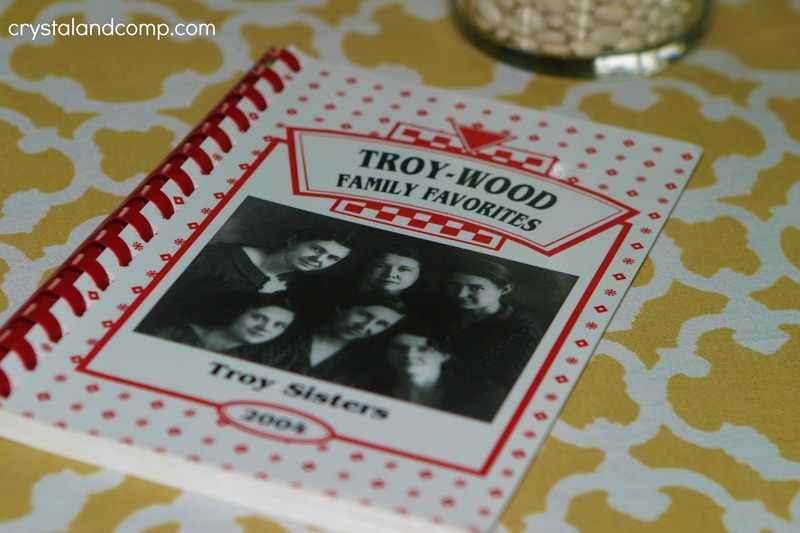 The one that includes recipes from my Grandmother and her sisters? Well, this Chicken Divan recipe is from that cookbook, and just adapted a little bit. 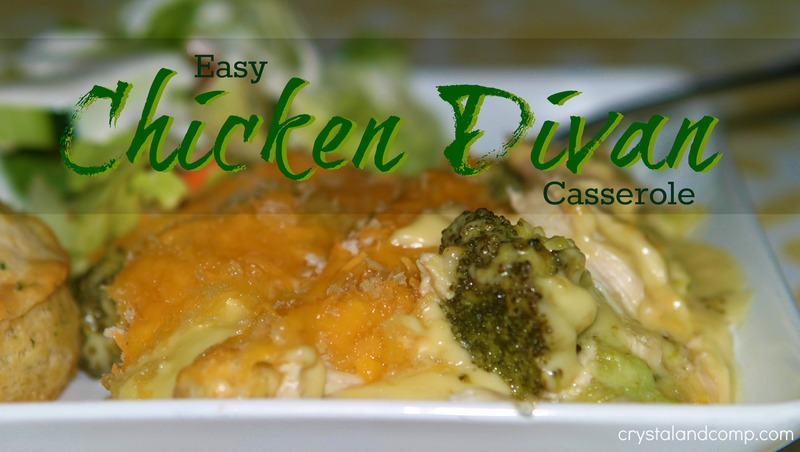 As I have looked online at other Chicken Divan recipes, they all are very similar: soup, chicken, broccoli and cheese. 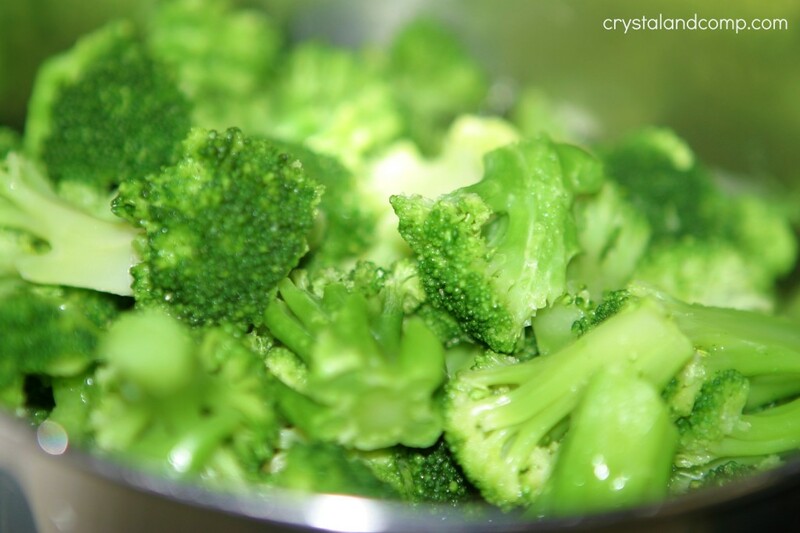 Get your broccoli steaming. Once done, set aside. While your broccoli is steaming, dice up your chicken. I like to grab rotisserie chickens from the deli at Target. Did you know that often times if you buy a cold rotisserie chicken it is cheaper. At my Target they sell for a dollar less. They are leftover from the day before and put into the fridge. I bring it home and de-bone it and dice it up. I freeze the diced chicken in ziplock bags in 2 cup increments to have on hand for casseroles (I consistently get 4 cups from one chicken). Such a huge time saver. In a large mixing bowl combine the soups, mayo, lemon juice and curry if you’re using it. Take a stick of butter and coat the sides and bottom of your 9×13 casserole dish to prevent sticking. 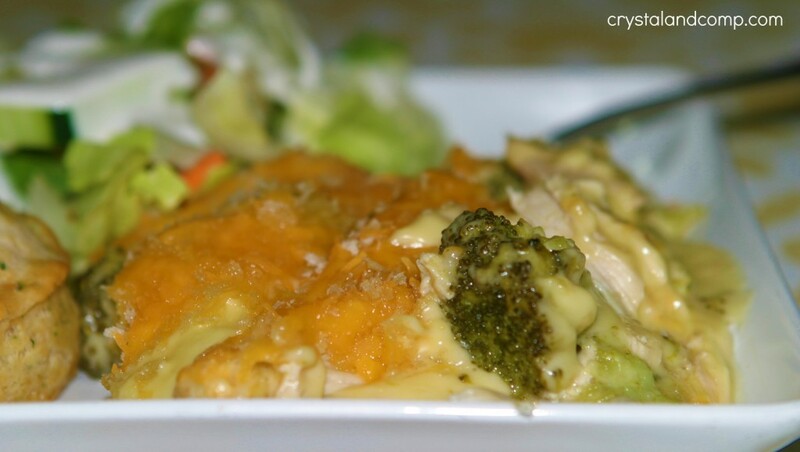 Toss the chicken and broccoli into your casserole dish. Pour your soup mixture over the meat and broccoli. Use the back of a spoon or a spreader to evenly coat the soup mixture over the chicken and broccoli. 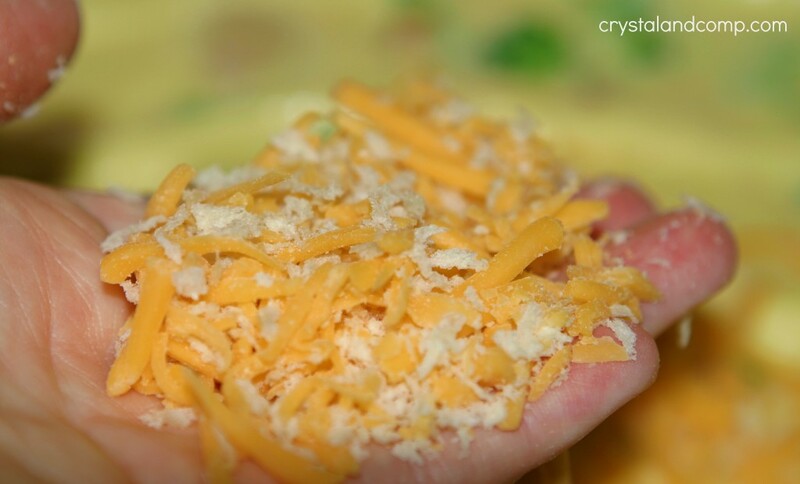 In a small bowl or in a ziplock bag, mix together the shredded cheese and bread crumbs. Sprinkle this mixture over the top of the casserole. Take the 1-2 tablespoons of butter and cut it up into squares. 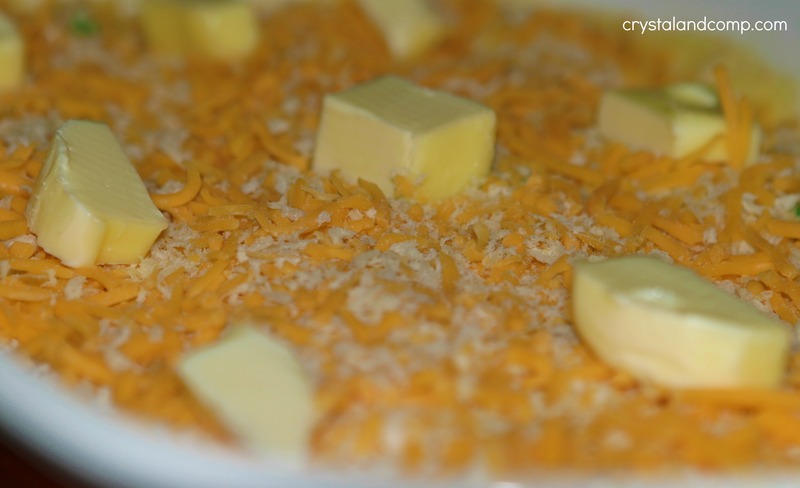 Place these pats of butter evenly over the top of the cheese and bread crumb topping. 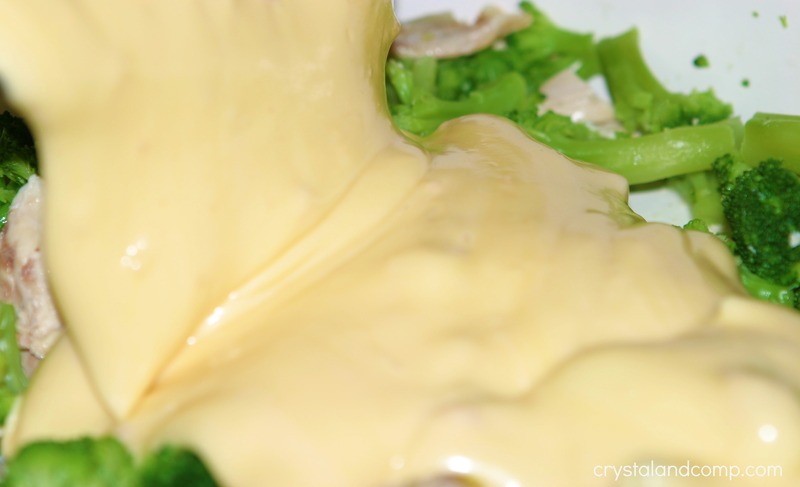 Toss it in the oven and bake for 30-40 minutes until the cheese is bubbly. Remove from the oven and plate it up. We served this with a dinner salad and rolls. While your broccoli is steaming, dice up your chicken. I used a diced up rotisserie chickens from the deli. 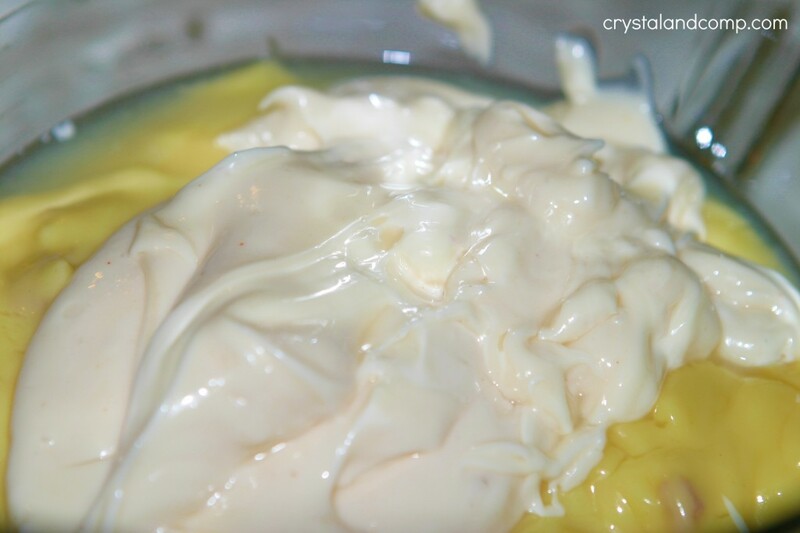 In a large mixing bowl combine the soups, mayo, lemon juice and curry if you're using it. Stir until well blended. Take a stick of butter and coat the sides and bottom of your 9x13 casserole dish to prevent sticking. 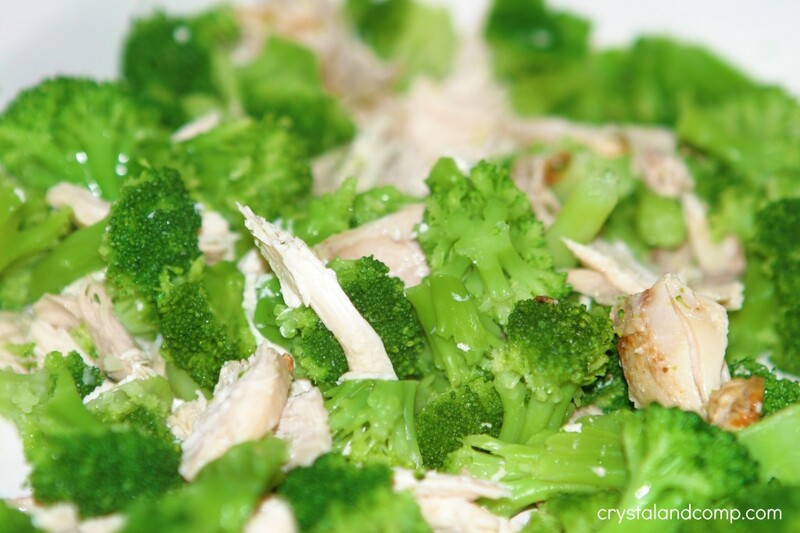 Toss the chicken and broccoli into your casserole dish. Spread it out evenly. 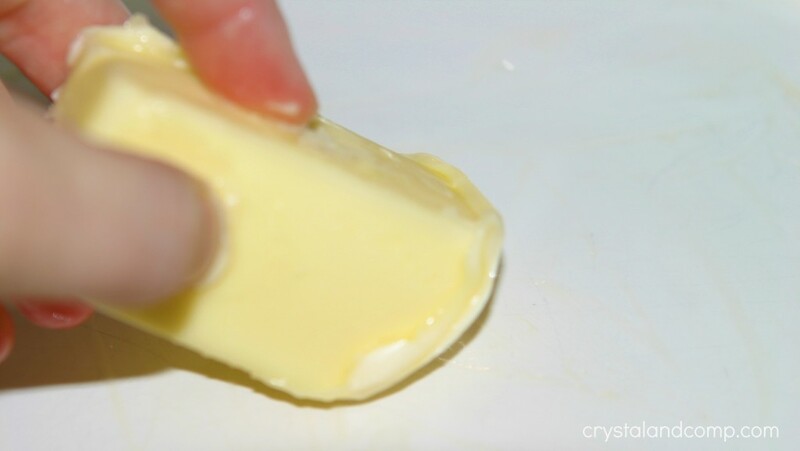 Take the 1-2 tablespoons of butter and cut it up into squares. Place these pats of butter evenly over the top of the cheese and bread crumb topping. 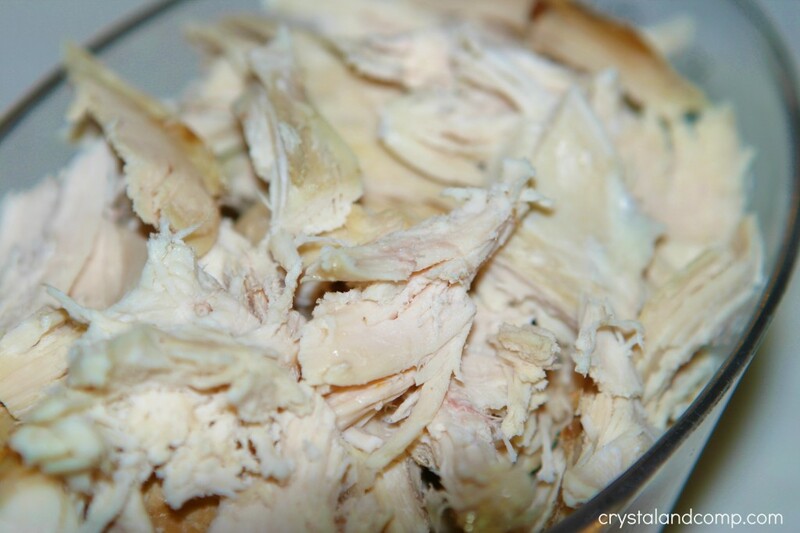 Did you know that often times if you buy a cold rotisserie chicken it is cheaper. At my Target they sell for a dollar less. They are leftover from the day before and put into the fridge. I bring it home and de-bone it and dice it up. I freeze the diced chicken in ziplock bags in 2 cup increments to have on hand for casseroles (I consistently get 4 cups from one chicken). Such a huge time saver. 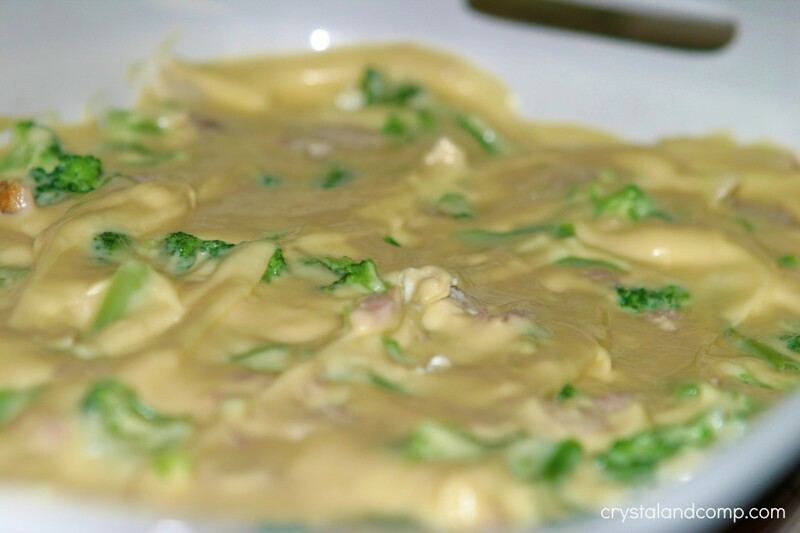 It is very easy to make, is budget friendly and my family had seconds! I will most definitely make this again. That is a really nice dish. Thanks for providing the recipe. I will definitely try making it sometime. This looks great! Thanks for sharing your chicken divan recipe and linking to Tempt My Tummy Tuesday. Thanks so much for sharing this recipe. It looks real similar to one I already make, but I will have to try putting the panko breadcrumbs on next time. Have a great week! This is such a classic dish and I forgot about it. Thanks for reminding me to make this. This is a very delicious Chicken Divan Casserole. Hope you are having a great weekend and thank you so much for sharing with Full Plate Thursday. Made this last night: Amazing!! Everyone LOVED it and I barely had enough for leftovers! Thank you so much for this recipe! I made it with the curry and it was delicious! !